It will be a great concert, I will do my best to attend it. Man I really sorry for uncoming for the lexture of SMTP. 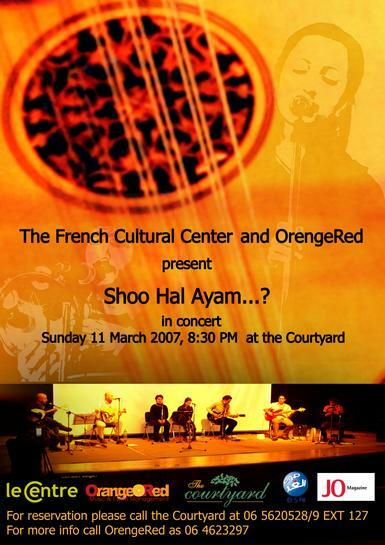 Inshallah comming on the concert. Kindly,I tried to call phones at there ad. but no one could help me. What should I do?? I’m so glad you are intersted in our concert, please try to contact them on sunday, if the same happened, please inform me. eaish hal gomhoor 70 alf wa7ad …..
i’m positive you rocked the place.. to bad i missed it..
i hope to be in jordan soon to hear you guys playing live! I have just got the chance to listen to the link bahaa sent me …i just want to say first am so proud of bahaa as i always have been second am so proud that you guys are representing my genaration…i wish i was in amman to attend all but damn the fact that i hate jordan! and am away…..
Bahaa….please keep me updated with the upcoming musinc you guys compose and though you haven’t replied to my SMS bs its a request to the whole group if you guys can also mix and match all the palestenian lebanese traditional wedding songs it would be a great hit and i think many of our age guys and gurls would love to have it instead of the crap p[loayed in weddings plus i wanna work on spreading it here in UAE as well..i think it will make ahuge hit! Keep me posted….and BEST OF LUCK TO ALL OF YOU ..GREAT JOB!